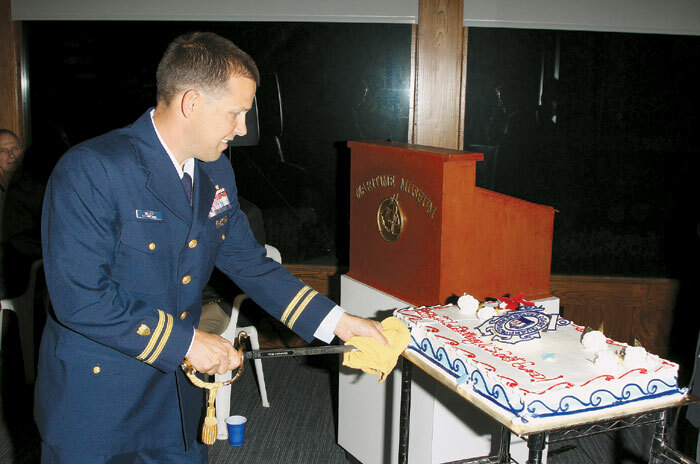 CHANNEL ISLANDS HARBOR — Channel Islands Maritime Museum hosted its annual Birthday Party Aug. 3 in commemoration of the 222nd anniversary of the U.S. Coast Guard. Guests in attendance included personnel from Coast Guard Station Channel Islands, members of Coast Guard Auxiliary Division 7, museum staff and invited guests. The U.S. Revenue Cutter Service, established in 1790, merged in 1915 with the U.S Life Saving Service, the Lighthouse Service, the Steamboat Inspection Service and the Bureau of Marine Inspection and Navigation to become what we know today as the Coast Guard. In 1939, Congress passed legislation that established the Coast Guard Reserve as a civilian component of the Coast Guard. In 1941, a military reserve was created and the volunteer reserve renamed as the Coast Guard Auxiliary. Channel Islands Maritime Museum presented the Coast Guard with a model replica of the 165-foot 1934 Coast Guard cutter Dione.